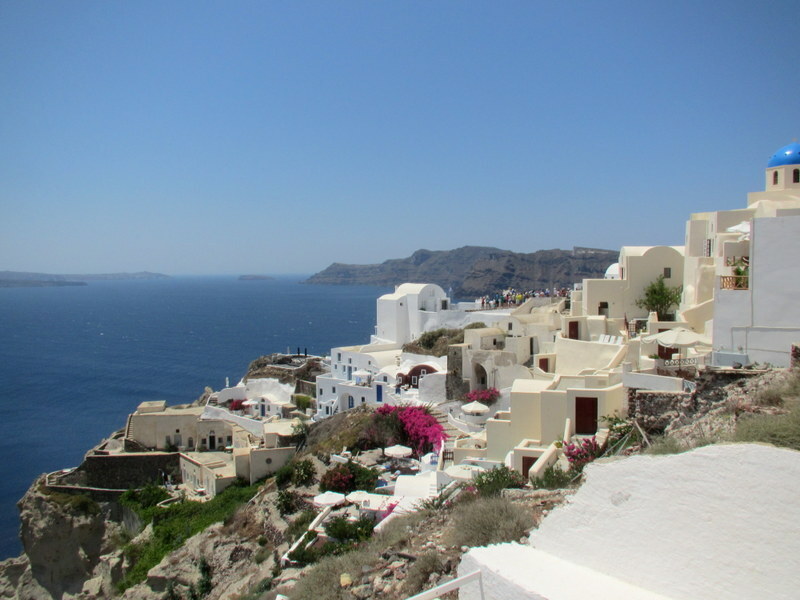 My impression is that when Americans think about Greece, the visuals that spring to mind are of the Acropolis and the islands. (At least that’s how it was before the financial crisis. Now I guess a news photo of some sort of chaos is included in the slideshow.) 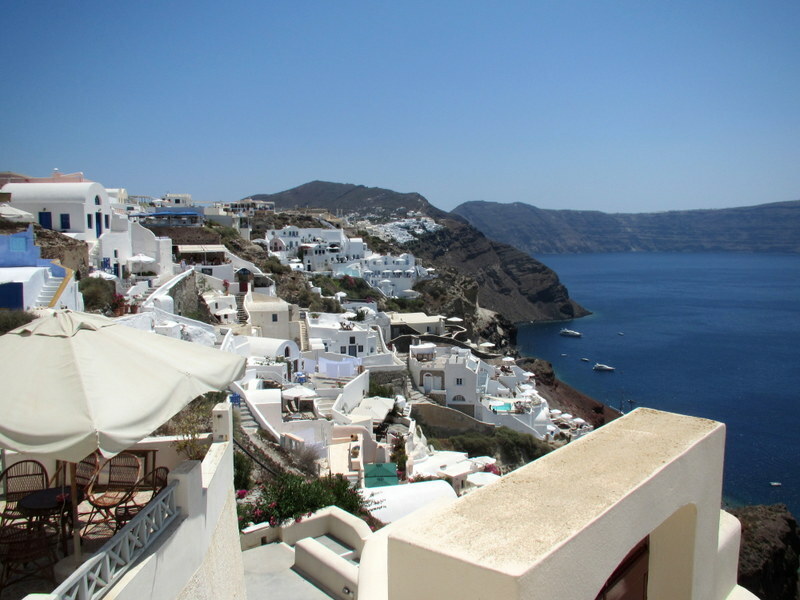 And, when it comes to the Greek islands, the usual images are of the clubs on Mykonos and the caldera at Santorini. I like to post about Greece from the perspective of an American living in an area relatively few foreign tourists visit but we’ve been to Santorini three times in the last 10 months, and it’s been suggested that I post something about this most touristy of all Greek islands. 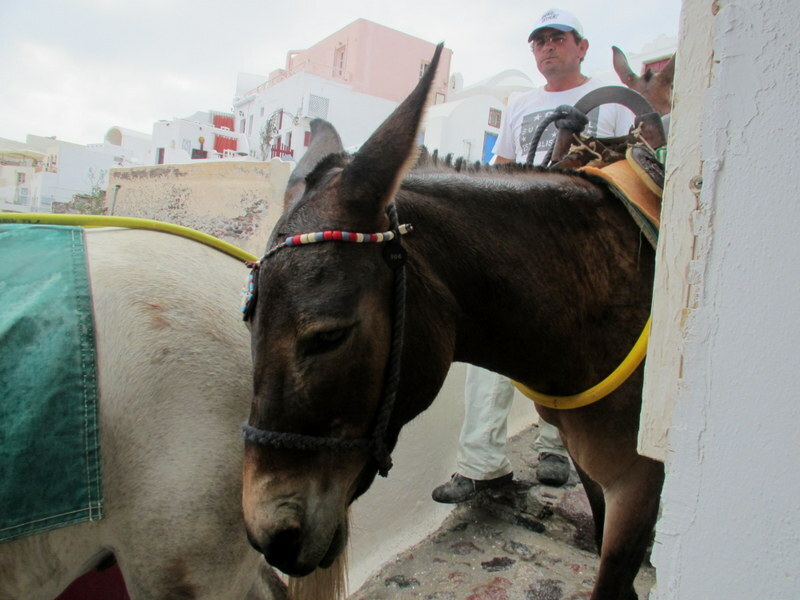 Since I can’t think of a way to approach Santorini in a single post, I’ll put up several installments in the coming days (I hope), each dealing with an element of the unique experience that is Santorini. And I’ll start with the blockbuster. 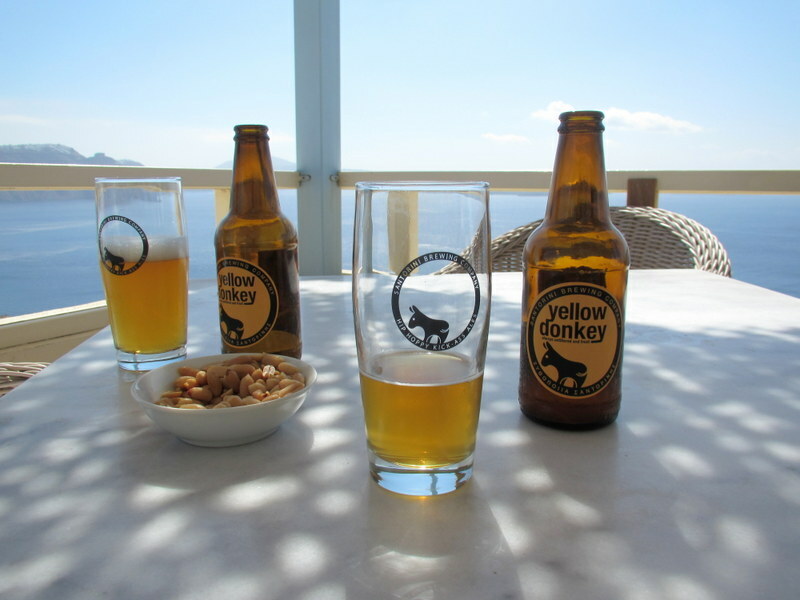 Santorini’s raison d’etre. The feature that draws the hoards. That which makes Santorini unique among Greek islands. The caldera. 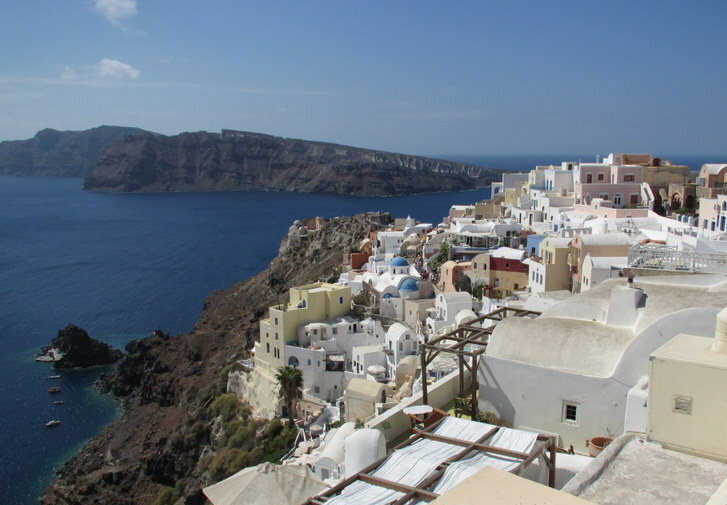 In about 1700 BC, Santorini experienced the mother of all volcanic explosions, a blast that left a ring of three islands on the periphery of a gigantic caldera. 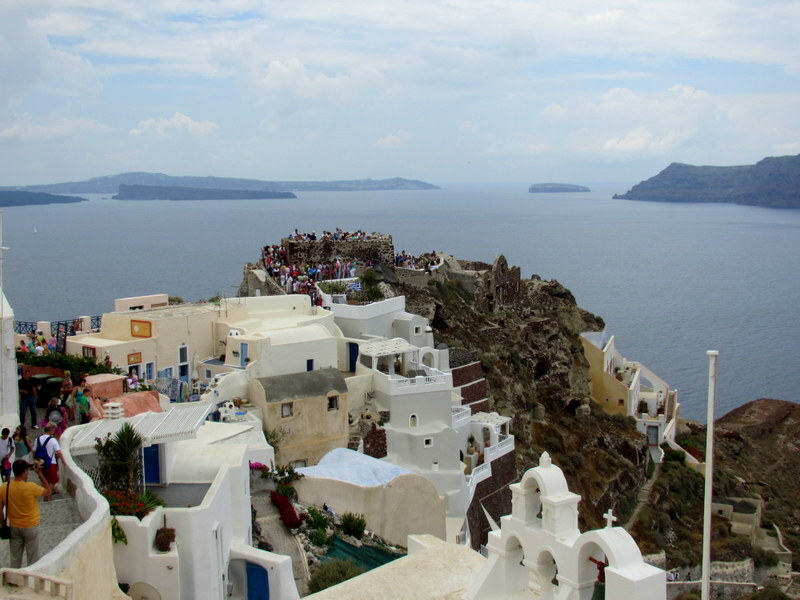 The biggest of the three islands, shaped like a backwards “C,” is Santorini. Even standing on the rim it’s hard to get a feel for the enormity of the caldera but it’s about 7.5 miles on the north-south axis and 4.3 miles east to west. 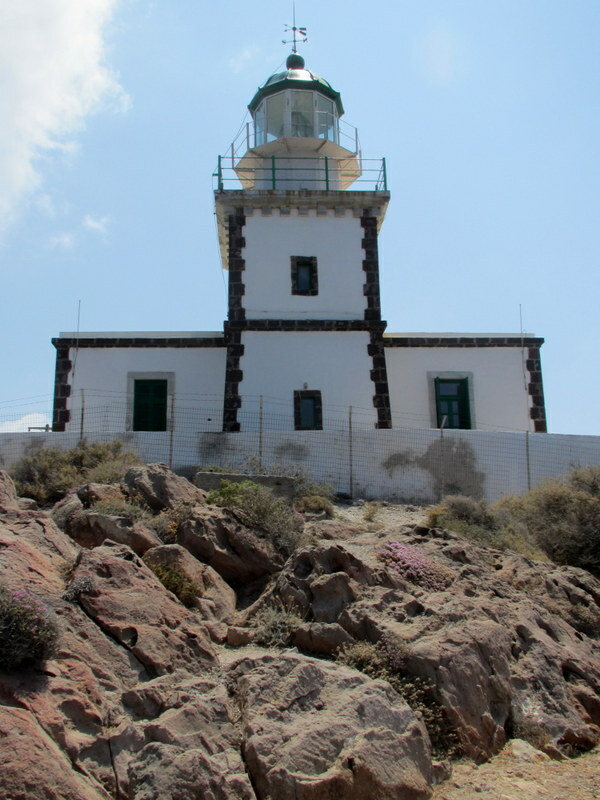 The high point of the rim, the village of Imerovigli, near the center of this photo, is 300 meters above the sea. 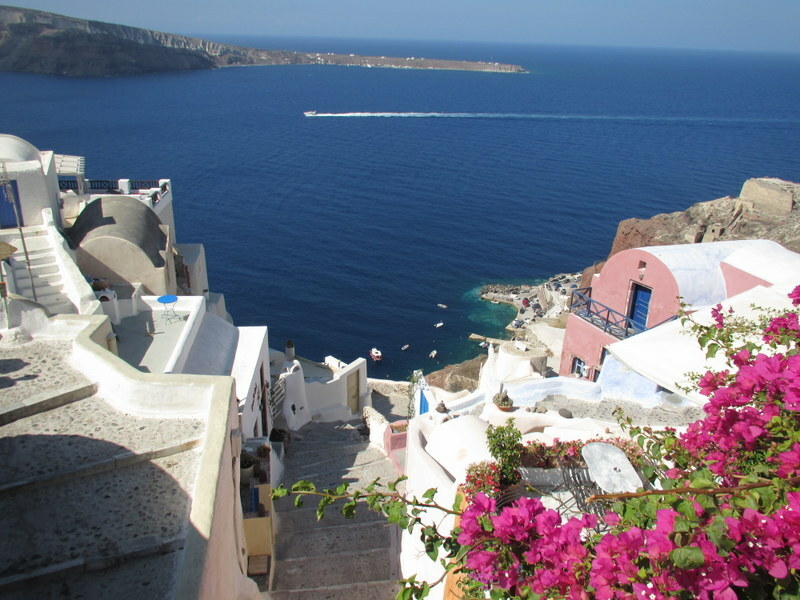 The overwhelming majority of visitors to the caldera come to Santorini but a smaller island on the other side, Therasia, is also inhabited and welcomes day-trippers mostly. In addition, two small islets in the center of the caldera have risen from the depths since the big bang 3700 years ago. The volcano is still active, and dozens of boats daily take tourists out to Nea Kameni to see the volcano and swim in the adjacent hot water. The photo above was taken from near the center of the backwards “C”, looking north. That which looks like frosting on the top of the rim are the clustered houses of the villages that line the caldera. 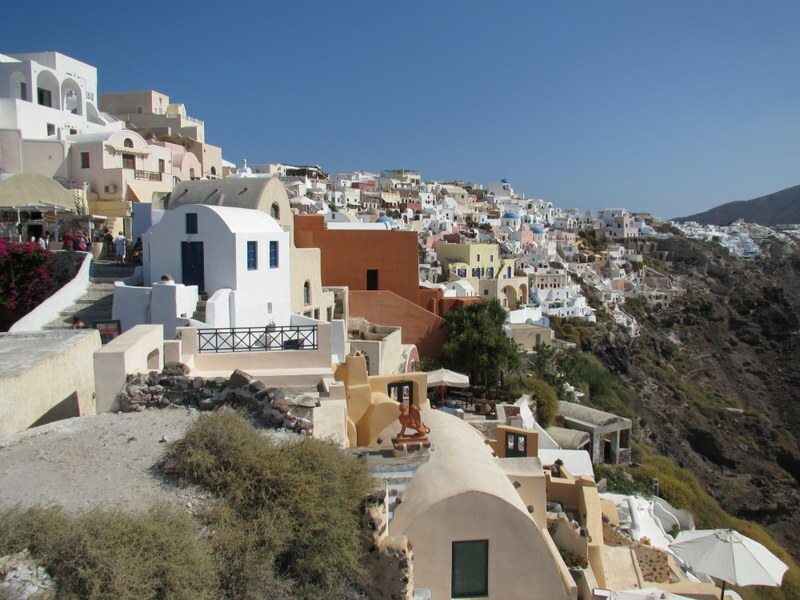 The northernmost village, barely visible atop the arm stretching to the left, is Oia, the most famous and most visited spot on the island. This is what makes Oia famous and infamous. The exquisite beauty of the little whitewashed house against the deep blue sea far below. And the hoards of motor coach and cruise boat tourists that squeeze themselves into the tiny village daily, usually traipsing after a cosmically bored tour guide who stops every minute or two to rattle off the memorized script in all the languages of the UN. That viewpoint where they’re all standing or waiting to stand is the foundation of a cathedral that went careening into the sea during a terrible earthquake in 1956. It’s the westernmost point of the island, and a dead-end, so once you’ve shot your selfie there you have to turn around and fight your way back through the throngs. Looking to the southeast along the caldera from Oia. 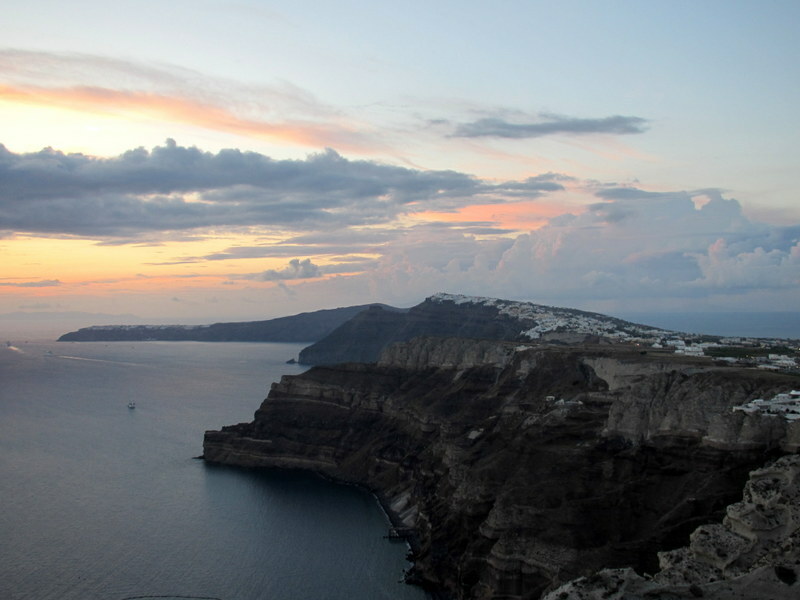 Looking northwest over Oia. The cliffs beyond are the island Therasia. 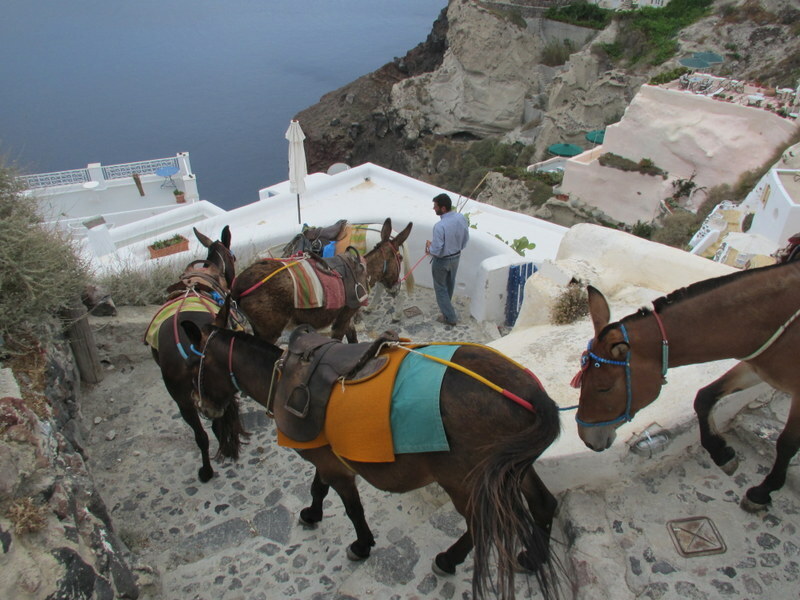 The locals use donkeys to haul tourists up and down the caldera steps. There are also a couple of roads and a couple of cable cars from the ports. Ah, Michael, you captured a very special memory here of our Greece trip. 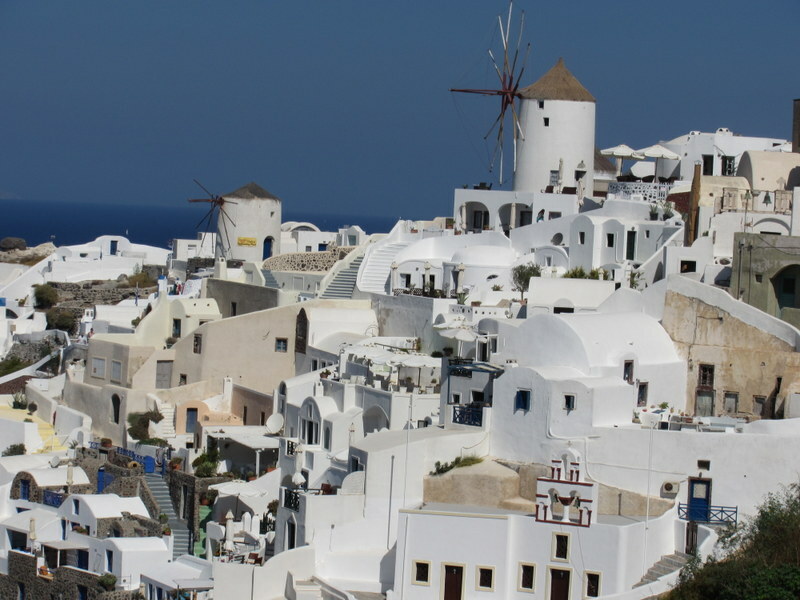 We loved Oia (once we got away from the throngs) and your photos do it justice.